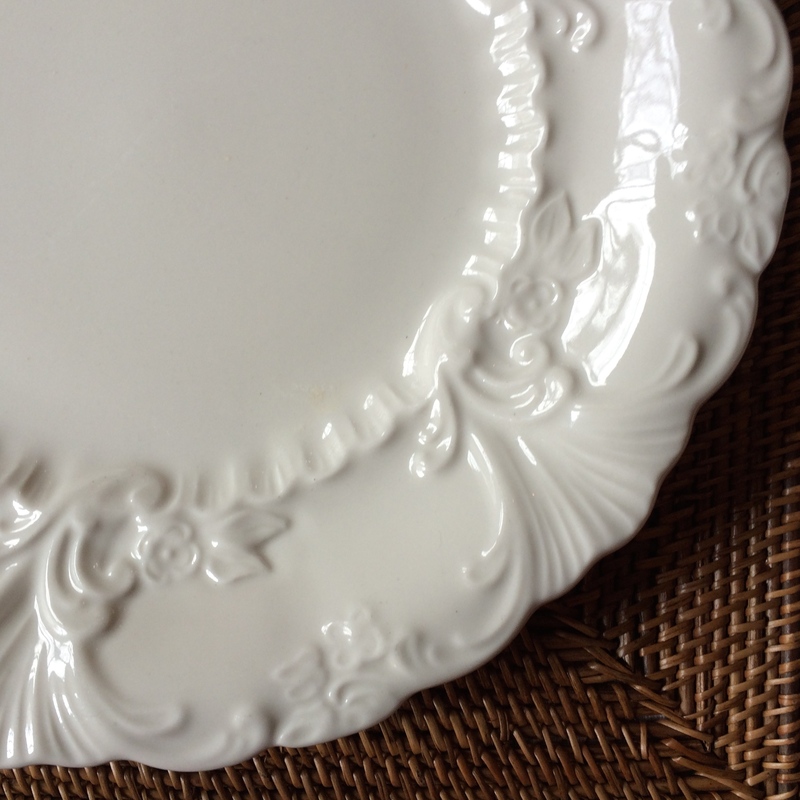 Recently, I found a very old semi porcelain platter in less than pristine condition. I noticed that the gold trim was very very worn, in fact absent in some areas yet, the glaze was excellent, no cracks and only slight crazing on the bottom. On the bottom of the platter was a mark unknown to me. At once, I tucked it under my arm. The platter appealed to me in many ways – it was well loved, very heavy and a mystery to me! The search began with the back stamp. The typography is representative of the Arts ad Crafts era; beautiful but it was difficult to read. I relied on auto-correct in the Google Search Engine using only the last four letters and . . . Voila! In a few hours, I discovered that the platter was manufactured by the H.R. Wyllie China Company in Huntington, Ohio between 1910-1920. 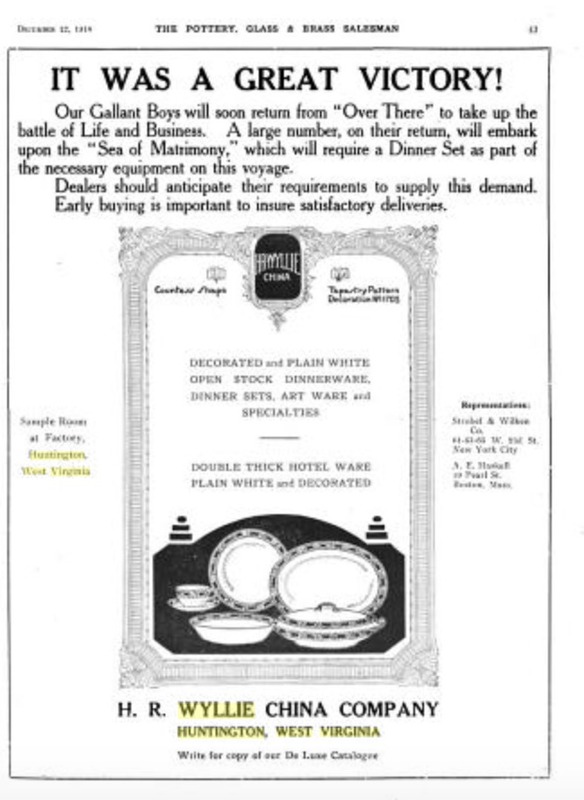 The design for the back stamp is at the center of the insert graphics in the advertisement for the Wyllie China Company. Judging by the weight and size, the platter was part of the “double thick hotel ware.” As written in the advertisement, there is more evidence that Mr. Wyllie was truly committed to the quality of the china produced in his pottery. He went so far as to write a letter to the editor of The Pottery and Glass Journal asking for a correction. He insisted that he did not produce souvenir plates but china for the most discriminating! As a manufacturer and business man I appreciate to the fullest possible extent the benefits that will accrue to the business life of West Virginia from the construction of permanent roads. I know that it will mean much from a material viewpoint to the farmer, the miner and the laborer. Good roads mean better schools, more churches and the eradication, of illiteracy. They mean a more contented and more intelligent citizenry and give our boys and girls better opportunities than those which were enjoyed by the mature men and women of today. The legislation for new roads was passed, which led to some speculation that Mr. Wyllie might better serve the community as a member of the West Virginia Legislature. He was respected as a civcl leader, business owner and a producer of quality goods. Five years later, Mr. Wyllie died. The china company soon closed its doors, years later the massive structure was demolished leaving behind memories for those who lived in Huntington. A few years back, a new road was built in Huntington. The work crews noticed potshards in the rubble left behind from the demolition of the Wyllie China Company. Some residents of Huntington arrived at the scene in search of those fragments of their history. One long time resident added that he still remembered Mr. Wyllie smiling at him when they passed on the street. Mr. Wyllie left a a beautiful legacy. No longer a mystery to me, the H. R. Wyllie platter is important to the history of Ohio River Pottery. The manufacture of pottery along the river depended on rich sources of clay, supplies of natural gas and a river to transport the wares far beyond the borders. Geography isa powerful predictor of sustainable production, after all. But, digging deeper into the story of the goods produced, there is yet another story about the men and women who established potteries and worked in the potteries over generations. The well-loved platter with only remnants of the gold trim is one hundred years old – a century – and a history tied to Mr. Wyllie. I just love his bow tie! Almost, thirty years ago, a package arrived postmarked from the Homer Laughlin Company, Newell, West Virginia quite unexpectedly. A few days before, we were at the International Housewares Exhibition in Chicago. It was a big deal, a really big deal. Now, as then, it was the biggest trade show in the country at one of the biggest exhibition halls in the world under one roof. McCormick Place, a modernist structure designed by Gene Simmons, a student of Mies van der Rohe, is located on Lake Michigan. Sited as it was, the rebuilt McCormick place celebrated space perched on the coast with an unending vista of water and sky – the building occupies acres of land yet does not obstruct the view like a skyscraper while the interior remains open. Stepping into that place was a tad intimidating for a fledgling very small business owner but, how else to know what is happening? One of the hundreds of exhibitors was The Homer Laughlin Company represented by a Mr. Wells. He was very generous with his time; he welcomed us into the booth heartily. As we spoke, the conversation turned to patterns. 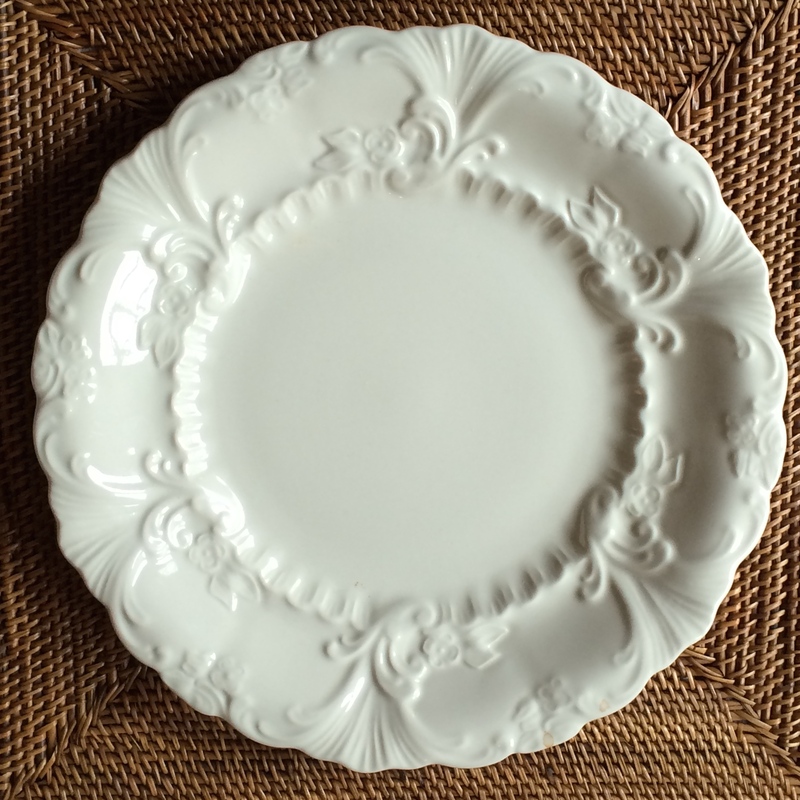 The new line of colorful Fiesta Ware was popular, but I gravitated toward a pure white plate with a deep rim, scalloped edge and classic ornamentation. It was very modern looking – but not. The plate was a part of the Best China Line i.e.. Restaurant Ware. He asked, “Why would you want this plate?” Later informing me that he could not sell this plate to a retail outlet unless we could order large quantities. His warmth and kindliness made the bad news sound not so bad. Three days later, the plate arrived. For many years, this plate was part of the lore of our family. . . the story was, “a manager from Homer Laughlin sent this plate.” The plate packed a powerful message; generosity and kindness. This story remains one of the most important business lessons that I have learned. 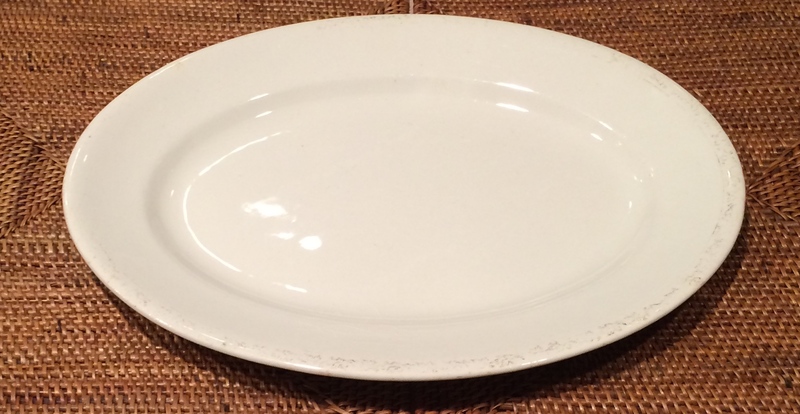 Over the years, the pleasant memory inspired a collection of white restaurant ware. It has been a sentimental journey from that memorable beginning. Years later, I learned that the history of the Homer Laughlin Company was integral to understanding the history of Ohio River Pottery. As it turned out, Mr. Wells was not merely a manager or salesperson. 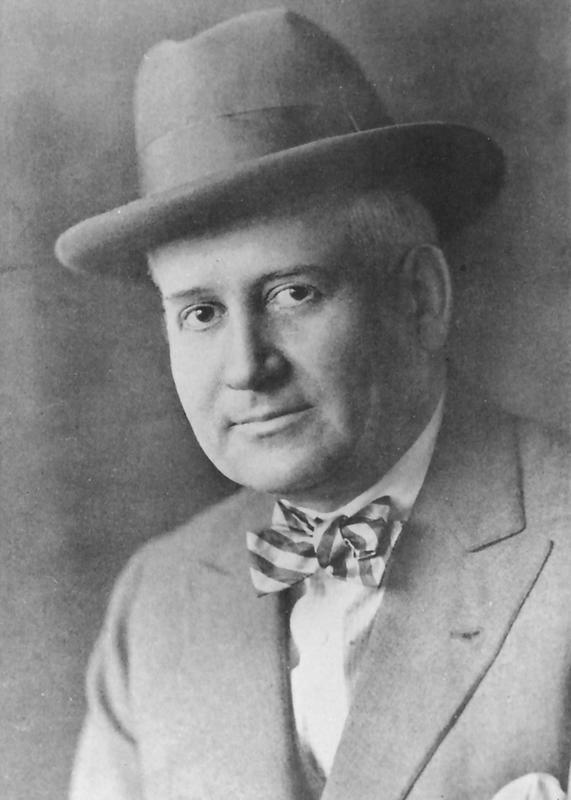 His family owned and operated the Homer Laughlin Company. The Wells family led an expansion of the pottery. 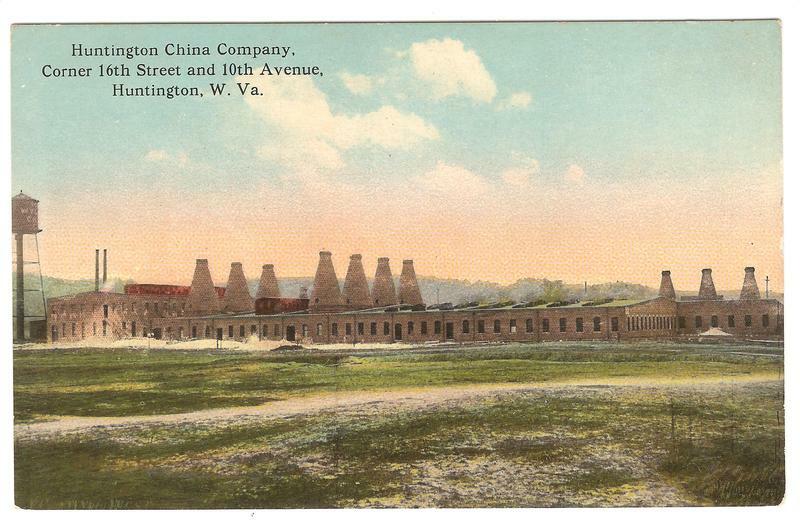 By the end of the nineteenth century, five kilns produced white ware instead of the much maligned yellow ware produced throughout the nineteenth century. Laced thought out early accounts of the Pottery Industry, there are comments made by workers, observers and reporters. Most commentators noticed the mutual respect that owners shared with workers – mutual respect become one of the core values for the Homer Laughlin Company and the other potteries in East Liverpool. So, it was no accident that Mr. Wells sent the plate that he could sell. I am not sure how it happened. It all started in Missouri almost forty years ago . . . going to auctions and finding beautiful linens . . . looking for linens that were not polyester . 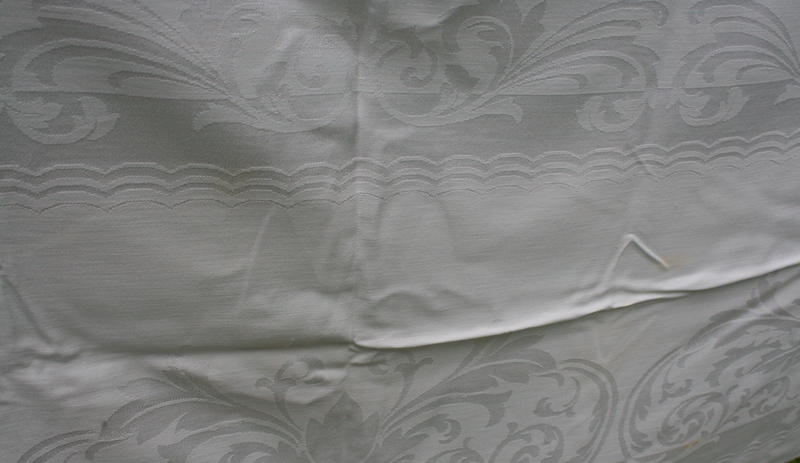 . . finding vintage linens so soft, so detailed . . . handmade by women who cared about the little things in life. It is not that they were not busy – wash dishes, wash clothing, make dinner without machines. Taking tatting thread and a hook and weaving lace trim for a hand towel; taking a needle and embroidering a name. Small details. 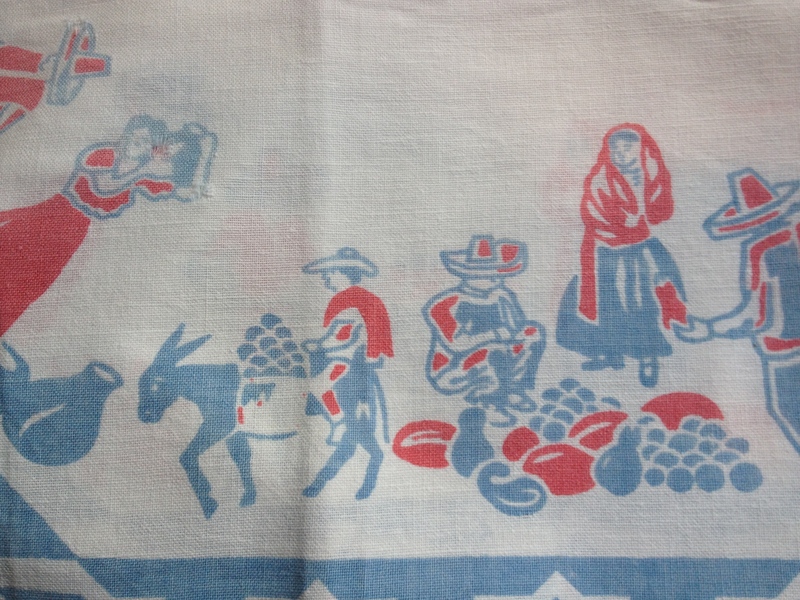 Setting a table with a tablecloth or setting the table for lunch in the field or at the table with a luncheon cloth made with colorful mid-century prints. Those were different times and days. . . I would cringe at the idea of paper napkins or even paper towels at the table. Not because of any reasons other than, my admiration for the women that took the time to set a table, iron linen and even sew and embellish table linens and bed linens; and my preference for soft linen around a child’s shoulders at dinner time or in my hand. This apron was found in a trunk that was filled with the presents presented to a teacher over many years in our small rural community. The fabric is elegant, much like the cotton used for shirt making when shirts were made by shirt makers! 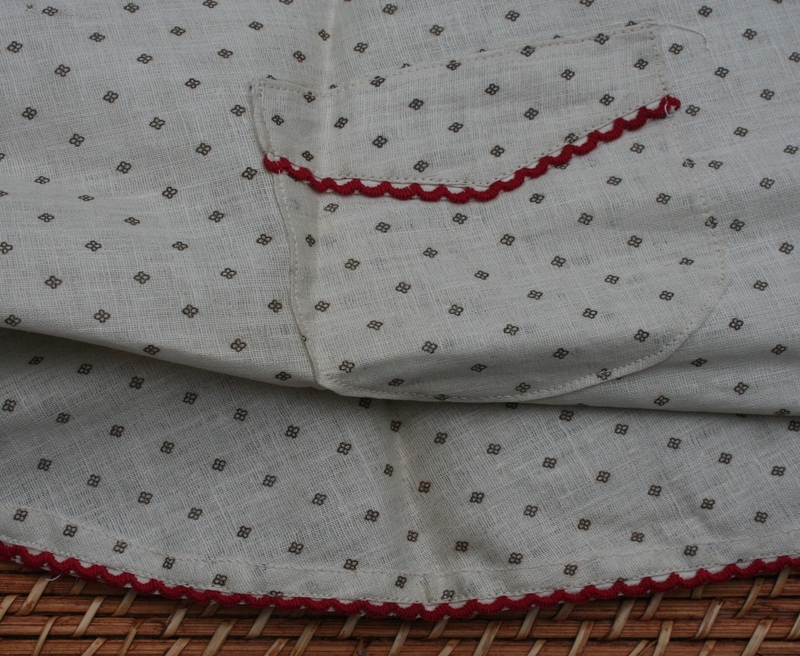 My preference for linen napkins is to use them without ironing – they are so soft and luxurious! Vintage fabric is durable if cared for properly. In my opinion, it is best to wash but not starch especially when stored; lightly starch for use if you choose; never store unless washed since the tiniest bit of an edible will attract nasty little critters (bugs/mice). If storing for a long time, it is best to wrap them. 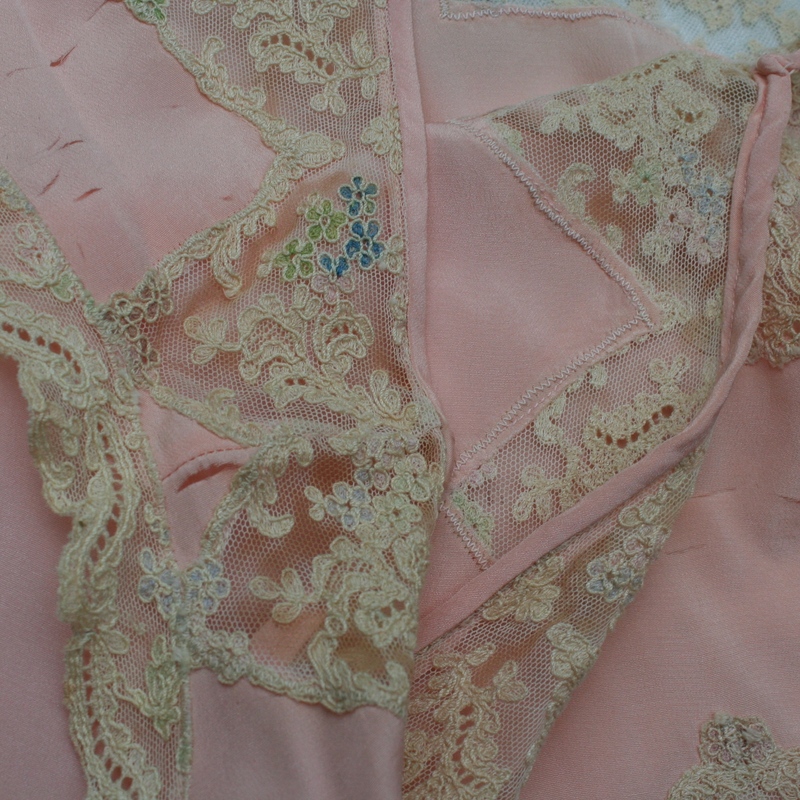 Recently, I found a few old nightgowns but one of them was covered with dust from an attic. I very carefully hand-washed the gown. The fabric was so deteriorated that it shredded in my hand. So sad. The lace used however is stable and so beautiful – it is perfect for a project! Just as they did so long ago, we have now adopted the habit of recycling, reusing and up cycling these fragments of the past . . . not only as patchwork quilts but in so many ways. I carried my new finds home. For many years, there were boxes of linens and no one seemed to want them not even my children! The collection soon outgrew the linen closet, chests of drawers and the dining room. Now, I have the pleasure of passing my finds on! And now, my children, older and wiser, appreciate my collection! Thankfully, many collectors now realize their value especially as those days become a more distant past. Hopefully, they will once again be well loved and passed on . . . I like restaurant china because it is built to last and tough to break in everyday use. Hitting it with a hammer will break it. But it is tough and durable. But I did not know anything about the history much less the economy of the along the broad swath of the Ohio River. For example, East Liverpool, Ohio was crowned as the Center of Pottery. I did not even know there was a place called East Liverpool! The first pottery in Ohio was established in the mid-eighteenth century according to The Museum of Ceramics in East Liverpool, Ohio. Fifty years later there were thousands of potteries – large and small supplying the country with wares for their homes. You have certainly used Ohio River Pottery in a restaurant – eg. 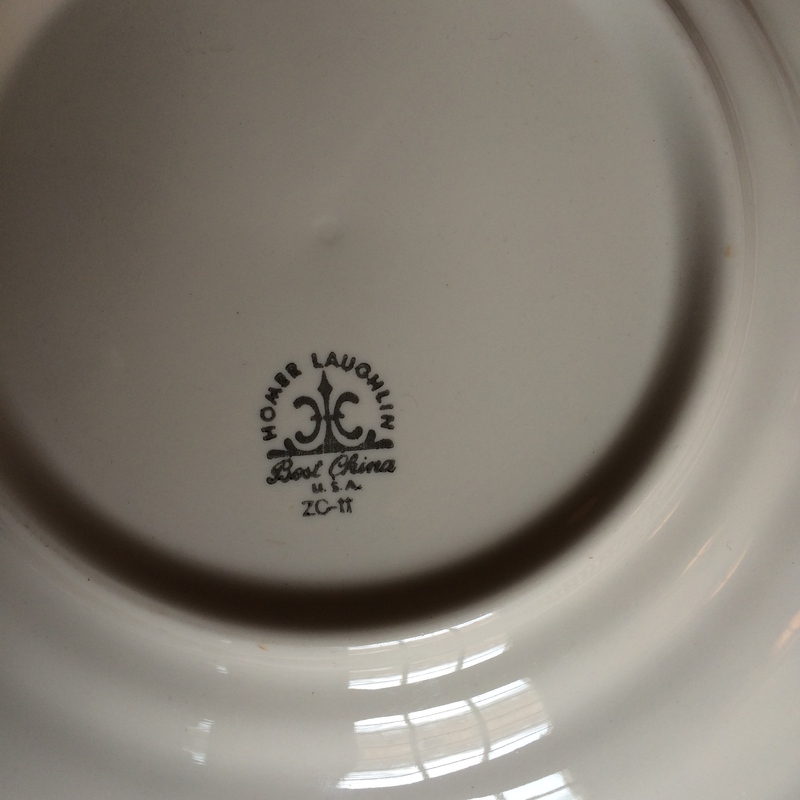 Hall, Laughlin, Syracuse – many believe that the best restaurant dinnerware is still made along the Ohio River! Locally, it was bricks. In 1920, the Brick and Clay Record informed their readers that production at the two plants in Nelsonville and the one plant in Logan were busy fulfilling orders placed from the previous year. Bricks made in Nelsonville won accolades at the World’s Fair and what is more, are highly regarded to this day. But still many believed that the best ceramics were produced in Europe. Local potteries fought to win the American market. This backstamp from Homer Laughlin illustrated their business plan – the American Eagle has launched an attack on the English Lion. Patterns from all of these potteries abound. The colors and images reflect the taste and style of previous generations – and sometimes politics. The durability of “restaurant china” is truly amazing – you can almost throw it. And it all looks great no matter the pattern or the mix. We had been thinking of a storefront for awhile; well actually, since the first time that the barn leaked. Or maybe, it was the moment that I realized that critters like to eat cardboard. Two years later, we finally found a place that just seemed just right . . . restaurants, the bike path, plenty of parking and a peaceful but lively country vibe. We had a history of good times at Eclipse – watching Eliot and Ezra work in the kitchen at Zoe’s (well, mainly they washed dishes) but they loved (and hated) their work! A little later, a family friend tried the restaurant business – we loved the food – but turned to a different career. Eliot and Katie celebrated their wedding (after stopping to help with a car accident on Route 33) at the newly renovated Company Store. Best of all for our vintage storefront, Eclipse Company Town is a fine example of historic preservation. We admired the vision – and fortitude – of the owners who restored the old buildings (ca. 1900). And they rose to the challenge after a tornado devastated the building that we call home! Perhaps, most importantly, we liked our neighbors – both private residents and our business neighbors. For reservations and special events follow their links here: Rickshaw Thai and Kiser’s Barbecue. A Historic Moment – Beer Comes to the Barbecue. Last but not least, the Hockhocking Adena Bike Path is amazing . . . we are an easy ride from Athens! We are happy to be here! Ride your bike or drive your car – stop by and check us out! We can’t wait to meet you! For a brief article about the Hocking Valley Coal Company see The Post. Article about Hockhocking Adena Bike Path is here.